On my last trip to Rome I got slogged by the taxi driver who drove us round the armpit of Southern outskirts Rome to finally deliver us at our hotel with a 79 euro bill. So much for calling me his “Bella Donna” and all his other whispered endearments. I went apoplectic and refused to pay it and we settled on 60 euros. I have since found out that every taxi (it’s written on their outside driver’s door) has the exact rate of 48 euros standard fee for a taxi from Fuimicino airport anywhere into central Rome. So point at the driver’s side door and say “quarantay-otto” when you find your taxi. You will no doubt be tired from your flight and probably having waited at least half an hour or much more for your luggage to appear on the luggage carrousels off your plane. You just want to get to your hotel room. Remember that Old Rome is very higgledy-piggledy and the close building walls make for increased noise at night whilst trying to sleep. You will hear every bin being filled with last night’s bottles, every un-mufflered scooter roaring past, every bin being emptied at 6 am and every reveller who thinks it’s clever to yell all night in the middle of the road. A hotel a bit further out from these attractions will be significantly quieter unless you choose a 4+ star like a Relais & Chateaux such as Hotel Raphael near the Piazza Navona at around 400 euros per night. We stayed up near Piazza del Popolo north of the Spagna or Spanish Steps and that was silent at night. If you go to Rome in July you will fry. Temperatures can get to high 30’s each day. Choose to see Museums, the Catacombes, Galleries (Galleria Borghese – the beautiful home of a bent Roman Cardinal – for example and then hire a pedal car to pedal round the gardens in the shade afterwards) and make sure you have an air-conditioned hotel room! Better still opt for a hotel with a pool – such as in the area known as Trastevere on the other side of the river from the Old City as it has larger hotels, it’s cute, quiet and cobble-stoned. If you go to Rome in August – especially mid-August – most things will be shut as the Italians go and clog up the beaches for their annual holiday. Rome is like a ghost-town at this time. Better still, don’t go in either of these months. Go in September or May when the weather is kinder for walking and exploring. To get the most out of your time in Rome – go on a guided tour, ride Segways in a group with a guide or have a hired guide take you round. I do not recommend you take one of the many ghastly and ludicrously over-priced Hop-on-Hop-Off Double Decker buses. They are not run efficiently and stop and start every few corners it seems and you are kept waiting for ages for people to get on and process their tickets. In the Summer months if you hop off chances are the buses will be too full for you to hop on again. The headphones are tinny and half the time don’t work. The commentaries are facile. A waste of money. Take the metro. The Keyhole of the Knights of Malta – a must do. 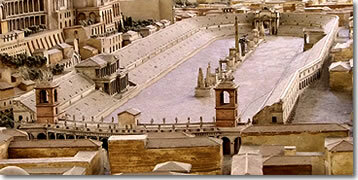 Take the metro to Circo Massimo. Take a short walk up the Aventine Hill, past beautiful Rose Gardens and you will come to a small park filled with orange trees . From this park there is a wonderful view of Rome. The nearby Church of Santa Savina dates back to 450AD. Check out its carved 5th century doors. Continue further along the road, and on the right hand side you will see an old green (paint is peeling off) gate. 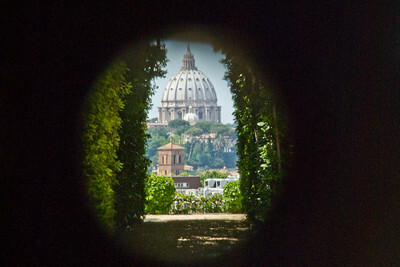 If you look through the keyhole, you will see a beautiful treelined path and at the end of the path is a framed view of St, Peters Basillica. It is breathtaking. These Knights of Malta now live in Rome and are the last vestiges of warrior Knights from the early Christian Crusades to the Holy Lands. Then go down the hill and explore the Circus Maximus which was used by the Romans for chariot races watched by hundreds and thousands of spectators and is one of the most ancient of all Roman sites. Possibly 8th century BC. No one knows for sure. Next Must see is: No, not the Mouth of Truth which everyone goes to see and have their photo taken with their hand in its gob. It is a heavy stone disc carved in the 4th century B.C. as a grotesque, bearded face with a gaping, dark slot for a mouth. It got its nickname, the “Mouth of Truth,” from the medieval tradition that holds if you stick your hand in its mouth and tell a lie, it’ll clamp down on your fingers. Apparently, a priest once added some sting to this belief by hiding behind the mouth with a scorpion, dispensing justice as he saw fit. 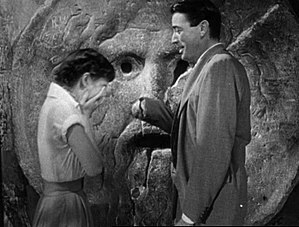 If all that sounds vaguely familiar, it’s because Gregory Peck did this in Roman Holiday to impress Audrey Hepburn. 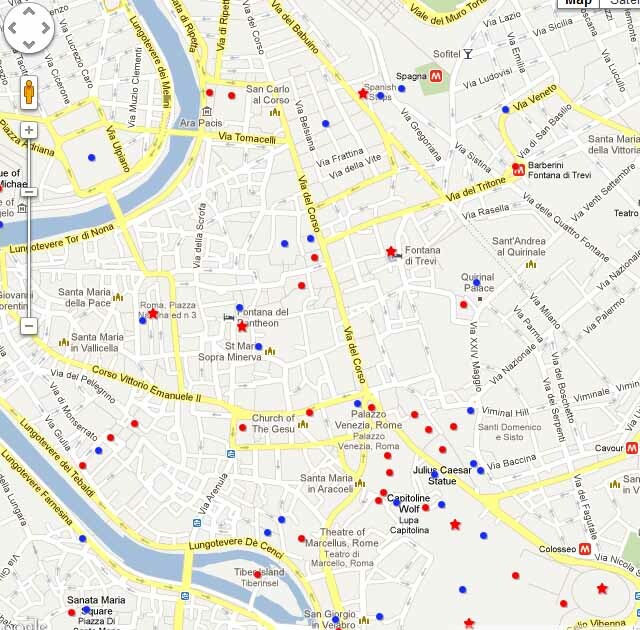 Next Must See: – get up early and get to the Vatican and St Peter’s by 8 am when it opens. Be the first to beat the crowds and climb up all the steps to the top of the Dome for an amazing view over Rome. You will also see a long partially covered walkway-wall connecting St Peter’s to the Castel St Angelo. This ancient Roman mausoleum commissioned originally by Emperor Hadrian, was built up with a palace ontop by the Vatican in the middle ages to help as a second hidey-hole for the Popes when the Vatican was under attack. 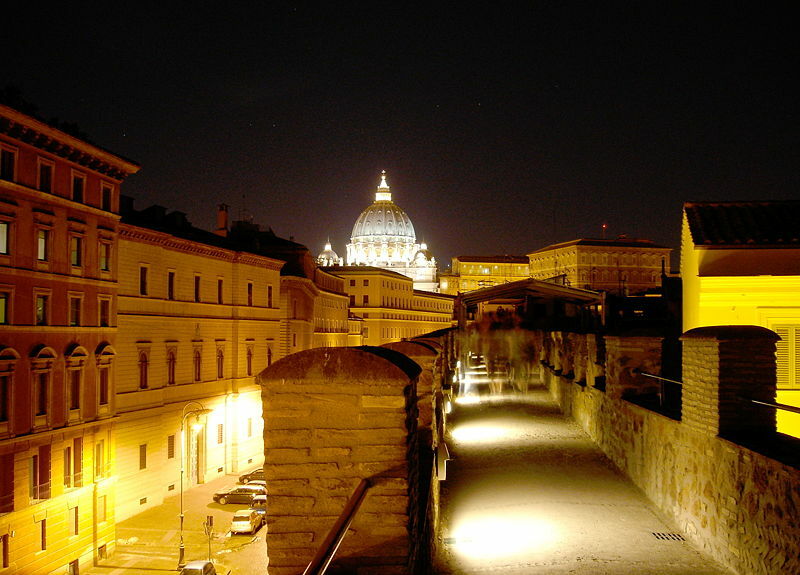 The Popes commissioned a walkway called the “Passetto di Borgo” to be made connecting St Paul’s to the Papal Fortress ontop of Castel Saint Angelo. Pope Clement used this very walkway to escape during the sacking of Rome in 1527. This photo here [by Raja Patnaik] shows this walkway with St Peter’s in the background. Now I could bang on forever about all the wonderful things to see. 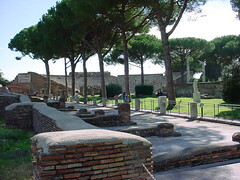 Just give yourself some time in Rome and catch the metro out to Ostia Antica. This ancient Roman port city is magnificent and will not have tourists crawling all over it like the Forum and the Colosseo does. It’s a 45 minute metro trip (change at Piramide onto the Lido line) When you get off at Ostia Anitca stop, cross the road via the blue sky-bridge and walk straight down Via della Stazione di Ostia Antica, continuing straight until you reach the parking lot. The entrance is to your left. One of my favourite little hotels to stay in? 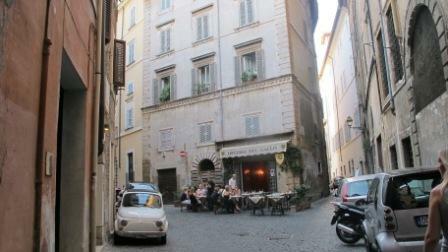 It is near the Trevi Fountain in an excellent location and is a well priced 4 star hotel called 87 Hotel. See details here.